Dendritic cells (DCs) are potent initiators of T cell-mediated immunity that undergo maturation during viral infections. However, few reports describing the interactions of DCs with Japanese encephalitis virus (JEV), which remains the most frequent cause of acute and epidemic viral encephalitis, are available. In this study, we investigated the interaction of JEV with DCs and macrophages. JEV replicated its viral RNA in both cells with different efficiency, and JEV infection of macrophages followed the classical activation pathway of up-regulation of tested costimulatory molecules and proinflammatory cytokine production (IL-6, TNF-α, and IL-12). On the contrary, JEV-infected DCs failed to up-regulate costimulatory molecules such as CD40 and MHC class II. Of more interest, along with production of proinflammatory cytokines, DCs infected by JEV released antiinflammatory cytokine IL-10, which was not detected in macrophages. Moreover, signaling through MyD88 molecule, a pan-adaptor molecule of TLRs, and p38 MAPK in JEV-infected DCs was found to play a role in the production of cytokines and subversion of primary CD4+ and CD8+ T cell responses. We also found that IL-10 released from JEV-infected DCs led to a reduction in the priming of CD8+ T cells, but not CD4+ T cells. Taken together, our data suggest that JEV induces functional impairment of DCs through MyD88-dependent and -independent pathways, which subsequently leads to poor CD4+ and CD8+ T cell responses, resulting in boosting viral survival and dissemination in the body. Macrophages and dendritic cells (DCs)4 are major players in early immune responses to many viruses (1, 2, 3, 4). Both cell types produce several cytokines, including TNF-α and IL-6, in response to viral infection (5). Additionally, both cell types serve as APCs, and DCs, in particular, function in vivo as potent APCs and play crucial roles in the enhancement and regulation of cell-mediated immune reactions (1, 2, 3, 4). Since DCs express various costimulatory and adhesion molecules, they can efficiently activate naive T cells in primary responses. Upon encounters with pathogens, immature DCs undergo maturation processes that are characterized by the production of proinflammatory cytokines (TNF-α, IL-12, and IL-6), up-regulation of costimulatory molecules (CD40, CD80, and CD86), alteration of chemokine receptors (CCR2, CCR5, and CCR7), and enhanced Ag presentation (6, 7). Because these events are crucial in the development of optimal antiviral responses, many viruses target these events to prevent the development of antiviral immunity and boost viral survival. The recognition mechanisms that initiate and control innate reactions to viruses remain poorly understood. Accumulating evidence suggests that membrane-bound cell-surface or intracellular TLRs form part of the surveillance system (8). Indeed, several of 13 recognized mammalian TLRs are known to be involved in the recognition of viral components (8). Additionally, cytosolic non-TLR dsRNA sensors, including protein kinase R, melanoma differentiation-associated gene 5 (MDA5), and retinoic acid-inducible gene I (RIG-I), have been found to play roles in DC activation (9, 10, 11, 12). All TLRs, with the exception of TLR3, use MyD88 as the main adaptor molecule to activate the downstream signaling pathway. Activation of this pathway, in turn, leads to the activation of NF-κB and MAPKs, such as stress-activated protein kinase/JNK and p38, which subsequently leads to the production of inflammatory cytokines (13, 14). Furthermore, the MyD88-independent or -dependent pathway results in production of IFN-α/β in response to stimulation of TLR3, TLR4, TLR7, TLR8, and TLR9 (15, 16). TLR3 and TLR4 can signal via Toll/IL-1R domain-containing adaptor-inducing IFN-β (TRIF), which induces IFN-β gene transcription partly through IFN regulatory factor 3 (IRF3) activation (17). TLR7, TLR8, and TLR9 activate some IFN-α genes through formation of the MyD88-TNFR-associated factor 6 (TRAF6)-IFN regulatory factor 7 (IRF7) complex (18, 19). However, NF-κB and MAPK are also activated by the MyD88-independent pathway. The point of intersection between the MyD88-dependent and -independent pathways is thought to be TRAF6 (20, 21). Japanese encephalitis virus (JEV), which is a mosquito-borne member of the genus Flavivirus, such as West Nile and dengue viruses, is responsible for most acute and epidemic cases of viral encephalitis (22, 23). Approximately 60% of the world population inhabits JEV endemic areas, and the virus is continuing to spread to previously unaffected regions due to global warming (24, 25, 26). It is estimated that 30,000–50,000 cases of JEV occur each year, resulting in 10,000–15,000 deaths, although this number may be underestimated (22, 23). Additionally, 30–60% of surviving patients suffer from serious long-term neuropsychiatric sequelae (27, 28). However, the pathogenesis of JEV-associated disease in humans and in mice has not been completely elucidated. In many cases, the virus is not directly involved in the destruction of brain tissue, but instead causes indirect damage through cell-mediated immune responses (29). Activated inflammatory cells secrete cytokines such as IL-1 and TNF-α, which can cause apoptosis of neuronal cells. Similarly, JEV infection leads to the production of high levels of cytokines such as macrophage-derived chemokine factor, TNF-α, and IL-8 in the serum and cerebrospinal fluid (30, 31, 32, 33). Increased levels of such cytokines may play protective roles against infection or initiate irreversible immune responses. JEV multiplies in macrophages and DCs of the periphery, which causes initial viremia before entry into the CNS (34). Therefore, most studies that have been conducted to evaluate the pathogenesis of JEV infection have examined the interaction of the virus with macrophages and CNS cells (30, 31, 32, 33). These CNS cells include microglia and astrocytes, which are major contributors to the production of inflammatory cytokines and CNS degeneration. However, there is presently little information describing the interaction between JEV and DCs, which play a major role in immune responses. Therefore, in this study we have compared the interaction of JEV with macrophages and DCs. Our data demonstrate that JEV infection induces differing modulations of cytokine production and phenotypes in both DCs and macrophages. We also defined certain roles of the MyD88 adaptor molecule in the cytokine production by DCs and macrophages and in the initiation of primary CD4+ and CD8+ T cell responses. Additionally, we gained insight into the contribution of IL-10 to primary immune responses following JEV infection. We suggest that imbalanced activation and modulation of macrophages and DCs in JEV infection are critical events that determine the immunopathological outcomes in the CNS and inadequate immune responses. C57BL/6 mice (H-2b), 5 to 6 wk old, were purchased from Koatech. OT-I and OT-II mice, which are transgenic for the Vα2/Vβ5 TCR that recognizes the H-2Kb-restricted peptide (OVA257–264, SIINFEKL) and the I-Ab-restricted peptide (OVA323–339, ISQAVHAAHAEINEAGR) of chicken OVA, were obtained from The Jackson Laboratory. MyD88-deficient mice (H-2b) were a gift from the Immunoregulatory Research Center (IRC), Ulsan, Korea. The investigators adhered to the guidelines set by the Committee on the Care of Laboratory Animal Resources, Chonbuk National University. The animal facility of the Chonbuk National University is fully accredited by the National Association of Laboratory Animal Care. JEV Beijing-1 strain was obtained from the Green Cross Research Institute (Suwon, Korea) and propagated by suckling mice brain passage. The titer of the virus in clarified brain lysates (HBSS-10% BSA) was determined by a cytopathic assay using Vero cells (CCL81; American Type Culture Collection). Similarly, brain lysates from healthy mice were prepared and used to inoculate a control group of mock-infected mice. HSV-1 strain 17 was grown in Vero cells using DMEM supplemented with 2% FBS, penicillin (100 U/ml), and streptomycin (100 U/ml). Virus stocks were concentrated by centrifugation at 50,000 × g, titrated by a plaque assay, and then stored in aliquots at −80°C until needed. The following mAbs were obtained from eBioscience or BD Biosciences for flow cytometric analysis and other experiments: FITC-anti-CD40 (3/23), CD80 (16-10A1), CD86 (GL1), MHC class II (25-9-17), MHC class I (28-14.8), PE-anti-CD4 (GK1.5), CD8α (53-6.7), CD11b (M1/70), and CD11c (N418). Anti-mouse IL-10 Ab (JES5-2A5) was used to neutralize the IL-10 activity. The mAb against the nonstructural protein 1 (NS1) of JEV was obtained from Abcam. The defined peptides of chicken OVA, OVA257–264 (SIINFEKL) and OVA323–339 (ISQAVHAAHAEINEAGR), and immunodominant peptide (glycoprotein B (gB)498–505, SSIEFARL) of HSV-1 gB were chemically synthesized at Peptron. JEV-specific primers for the detection of viral RNA (JEV10,564–10,583 forward, 5′-CCC TCA GAA CCG TCT CGG AA-3′ and JEV10,862–10,886 reverse, 5′-CTA TTC CCA GGT GTC AAT ATG CTG T-3′) (35) were synthesized at Bioneer. DCs derived from bone marrow cells (bmDCs) were prepared as previously described (36) with some modifications. Briefly, bone marrow cells from femurs and tibiae were cultured in RPMI 1640 supplemented with 2 ng/ml GM-CSF and 10 ng/ml IL-4. On days 5 and 8 the culture was replenished with 5 ml of fresh media containing cytokines. Cells were harvested on day 10 for use and then characterized by flow cytometrc analysis, which revealed that the culture generally consisted of >75% CD11c+ cells (25% CD11c+CD11b+ and 65% CD11c+CD8α+). Bone marrow-derived macrophages (bmMφ) were prepared by culturing bone marrow cells in DMEM containing 30% conditioned culture media of L929 cells (37). bmMφ was harvested by using trypsin digestion following a 7-day incubation. The prepared bmMφ was composed of >85% F4/80+ cells that consisted of 99.2% F4/80+CD11b+ and ∼1% F4/80+CD11c+ cells. bmDCs and bmMφ were fixed with 3% ice-cold formaldehyde 48 h after JEV infection and then blocked with PBS containing 10% healthy mouse serum for 1 h at 4°C. Following quenching by endogenous peroxidase with 0.2% H2O2 in methanol, infected cells were stained by overnight incubation at 4°C with a HRP-conjugated mAb against JEV E protein (38). After rinsing with PBS the color was developed with 0.3% H2O2 and 3,3′-diaminobenzidine tetrahydrochloride. JEV E protein expression in infected cells was then checked and captured using a light microscope equipped with digital imaging equipment. Relative levels of viral RNA in JEV-infected cells or the spleens of mice were determined by conducting quantitative real-time PCR analysis on a Mini Opticon system (Bio-Rad Laboratories) using a DyNAmo SYBR Green qPCR kit (Finnzymes) following reverse transcription of total RNA isolated from infected samples. The reaction mixture contained 2 μl of template cDNA, 10 μl of 2× Master Mix, 1.5 mM MgCl2, and 100 nM primers at a final volume of 20 μl. The reactions were denatured at 95°C for 10 min and then subjected to 50 cycles of 95°C for 30 s, 58°C for 30 s, and 72°C for 30 s. After the reaction cycle was completed the temperature was increased from 65°C to 95°C at a rate of 1°C/min, and the fluorescence was measured every 15 s to construct a melting curve. A control sample that contained no template DNA was run with each assay, and all determinations were performed at least in duplicate to ensure reproducibility. The authenticity of the amplified product was determined by melting curve analysis. The relative ratio of viral RNA in the infected samples to uninfected samples was determined. All data were analyzed using the Opticon Monitor version 3.1 analysis software (MJ Research). Sandwich ELISA was used to determine the levels of cytokines in the culture supernatants. The ELISA plates were coated with IL-2 (JES6-1A12), IL-4 (11B11), IL-6 (MP5-20F3), IL-10 (JES5-16E3), IL-12p70 (C18.2), IFN-γ (R4-6A2), and TNF-α (1F3F3D4) anti-mouse Abs purchased from eBioscience and BD Bioscience, and then incubated overnight at 4°C. The plates were washed three times with PBS containing 0.05% Tween 20, after which they were blocked with 3% nonfat-dried milk for 2 h at 37°C. The culture supernatant and standards for recombinant cytokine proteins (PeproTech) were added to the plates and incubated for 2 h at 37°C. The plates were then washed again and the biotinylated IL-2 (JES6-5H4), IL-4 (BVD6-24G2), IL-6 (MP5-32C11), IL-10 (JES5-2A5), IL-12 (C17.8), IFN-γ (XMG1.2), and TNF-α (polyclonal Ab) Abs were added. Next, the mixtures were incubated overnight at 4°C followed by washing and subsequent incubation with peroxidase-conjugated streptavidin (eBioscience) for 1 h. Color development was then performed by the addition of a substrate (ABTS) solution. Cytokine concentrations were determined with an automated ELISA reader and SoftMax Pro4.3, according to comparisons with two concentrations of standard cytokine proteins. The IFN-γ-producing CD4+ T cells in response to HSV-1 Ag was enumerated by ELISPOT (39). Briefly, CD4+ T cells purified from HSV-immunized mice were stimulated with HSV Ag-pulsed APCs on IFN-γ capture Ab-coated 96-well ELISPOT plates (Millipore). After 72 h of incubation, the plates were washed and biotinylated IFN-γ Ab was added and incubated for 2 h. After washing, streptavidin-alkaline phosphatase was added and the mixture was incubated for an additional 30 min. Spots were visualized by adding a 5-bromo-4-chloro-3-indolyl phosphate/tetra-NBT substrate solution (Promega) and counted 24 h later using a stereomicroscope. Conventional surface staining was used for flow cytometric analysis. Briefly, cells were suspended with PBS containing 1% BSA and 0.05% NaN3 at a concentration of 2 × 106 cells, followed by incubation at 4°C for 30 min with properly diluted mAbs. After staining, the cells were washed twice by spinning at 1200 rpm, 4°C for 5 min. To detect Ag-specific CD8+ T cells, intracellular cytokine staining was performed following an 8-h stimulation of synthetic peptide in the presence of 2 μM monensin (Sigma-Aldrich). For the intracellular IFN-γ staining, cells were stained for surface marker, washed, permeabilized, and stained with PE-conjugated anti-IFN-γ. Following fixation, cells were resuspended in PBS and then analyzed using FACSCalibur equipped with the CellQuest program (BD Biosciences) and WinMDI 2.8 software. The proliferation of CD4+ and CD8+ T cells was assessed by measuring the viable cell ATP bioluminescence (40). Briefly, Ag-specific CD4+ and CD8+ T cells were purified from OT-II and OT-I mice, respectively, using a MACS LS column (Miltenyi Biotec) according to the manufacturer’s instructions. The purified CD4+ and CD8+ T cells (5 × 105 cells/ml) were then cultured together with stimulator cells at different ratios. JEV-infected DCs were used as stimulator cells following pulsing with cognate antigenic peptides (OVA323–339 peptide for CD4+ T cells, and OVA257–264 for CD8+ T cells). Anti-mouse IL-10 mAb (10 μg/ml) was incorporated in some experiments to neutralize the IL-10 bioactivity. The culture was incubated for 3 days at 37°C in a humidified 5% CO2 incubator. Replicate cultures were transferred to V-bottom 96-well culture trays that were subsequently centrifuged to collect the cells. The proliferated cells were then evaluated using a Vialight cell proliferation assay kit (Cambrex Bio Science) according to the manufacturer’s instructions. An in vivo CTL assay was conducted as reported elsewhere (41). Briefly, syngeneic splenocytes of naive mice were pulsed with gB498–505 peptide (SSIEFARL, 1 μM) of HSV-1 and then labeled with CFSE (2.5 μM). To control for Ag specificity, peptide-unpulsed syngeneic splenocytes were labeled with a lower concentration of CFSE (0.25 μM). A 1:1 mixture of each target cell population was then injected i.v. into mice for evaluation. Splenocytes were then collected from recipient mice 24 h after adoptive transfer of target cells and analyzed by flow cytometry. Each population was distinguished by its respective fluorescence intensity. The percentage killing of target cells in immunized animals was calculated using the following equation: ratio = (percentage CFSElow/percentage CFSEhigh). Percentage specific lysis was determined as: [1 − (ratio of naive/ratio of immunized)]/100. A zosteriform challenge experiment was performed as described by Gierynska et al. (42). Briefly, the left flank area was depilated before challenge using a combination of hair clipping and a depilatory chemical. The animals were then anesthetized with Avertin (2,2,2-tribromoethanol) and 2-methyl-2-butanol (Sigma-Aldrich), and a total of five scarifications were made on an ∼4-cm2 area of the left flank region. A total dose of 10 μl of HSV-1 strain 17 (containing 1 × 106 PFU) were then applied to the scarifications, after which the area was gently massaged. The animals were inspected daily for the development of zosteriform ipsilateral lesions, general behavioral changes, encephalitis, and mortality. Where specified, the data were analyzed for statistical significance using a Student’s t test. A p value of <0.05 was considered significant. Kaplan-Meier curves were also generated for mice that survived the zosteriform challenge with HSV-1. The p values were then computed using the χ2 method. The survival rates of the two groups were considered to be significantly different if the two-sided p value was <0.05. JEV can multiply in murine macrophages without causing cytopathic changes (43). However, few reports regarding interaction of DCs with JEV are available so far. To examine the interaction of DCs and macrophages with JEV, bmDCs and bmMφ were morphologically observed following JEV infection. As shown in Fig. 1⇓A, bmDCs infected with JEV showed morphological changes, including rounding and detachment from the culture surface at 48 h postinfection (p.i.). Conversely, there was no apparent change in JEV-infected bmMφ. When immunohistochemical staining of the infected cells was conducted to identify the biosynthetic expression of viral proteins, both bmDCs and bmMφ were found to be permissible for the expression of viral E protein (Fig. 1⇓B). To further identify the interaction of both bmDCs and bmMφ with JEV, the titers of infectious progeny viruses in the culture supernatants of both cell types were determined daily by cytopathic assays using Vero cells. bmMφ induced the productive release of infectious progeny viruses with levels that peaked at 4–5 days p.i., while the productive release of infectious virus in bmDCs was not detected in cytopathic assays (Fig. 1⇓C). However, quantitative real-time PCR indicated that JEV viral RNA was capable of replicating in both cells, even though the viral RNA levels of bmDCs were markedly lower than those of bmMφ (Fig. 1⇓D). To evaluate the ratio of infected bmDCs and bmMφ, we determined the percentage of JEV-infected bmDCs and bmMφ using mAb against JEV NS1 protein, which is largely retained within infected cells and involved in RNA replication (44). As shown in Fig. 1⇓E, >50% of bmMφ were infected with JEV, but fewer bmDCs were found to be infected. Furthermore, to examine in vivo replication of JEV, we determined viral RNA load in splenocytes of JEV-infected mice. The viral RNA load was found to peak at 7 days p.i., after which it declined (Fig. 1⇓F). Additionally, splenic DCs (CD11chigh cells) and macrophages (F4/80high cells) were observed to be infected with JEV, as confirmed by intra- and extracellular staining with NS1 Ab (Fig. 1⇓G). The expression of NS1 protein peaked at 3 days p.i., and splenic F4/80high macrophages showed more effective expression of NS1 protein than did splenic CD11chigh DCs. However, the difference of JEV NS1 expression in CD11chigh DC subsets (CD11chighCD8α+ and CD11chighCD8α−) was not observed (data not shown). Taken together, theses results indicate that both DCs and macrophages can be infected with JEV, but that there are differences in permissiveness of viral replication. Permissiveness of DCs and macrophages for JEV replication. A, Morphological changes in DCs and macrophages infected with JEV. DCs (bmDCs) and macrophages (bmMφ) derived from bone marrow cells were infected with JEV Beijing-1 strain (5 × 105 50% tissue culture-infective dose (TCID50)/ml) and then observed for morphological changes at 48 h p.i. B, Immunohistochemistry for the expression of JEV E protein. The expression of JEV E protein in infected bmDCs and bmMφ was checked by immunohistochemistry at 48 h p.i. using mAb against JEV E protein. C, The levels of infectious progeny virus in the supernatants of infected bmDCs and bmMφ. The supernatants of JEV-infected bmDCs and bmMφ were harvested on the indicated days p.i., after which infectious viral titers were quantified by cytopathic assays using Vero cells (n = 3). D, Viral RNA levels of JEV-infected bmDCs and bmMφ. The total RNA extracted from JEV-infected bmDCs and bmMφ harvested on the indicated days p.i. was used to quantify JEV RNA by real-time PCR. The levels of viral RNA were expressed as relative levels to uninfected cells (n = 3). E, Percentage of bmDCs and bmMφ infected with JEV. The percentage of infected bmDCs and bmMφ was determined by flow cytometric analysis at the indicated time using mAb against NS1 protein of JEV (n = 3). F, In vivo kinetics of viral RNA load in the spleen of mice infected with JEV. The viral RNA load in splenocytes collected from JEV-infected mice (n = 3) on the indicated days p.i. was ascertained by quantitative real-time PCR. The bars in the graph represent the average levels ± SD of viral RNA relative to those in naive mice. G, The expression of NS1 in splenic DCs and macrophages of mice infected with JEV. Splenocytes of JEV-infected mice (n = 4) were stained with CD11c or F4/80 Ab at the indicated days p.i., after which the expression of NS1 in CD11chigh and F4/80high cells was determined by flow cytometric analysis following intra- and extracellular staining with NS1 mAb. The relative mean fluorescence intensity (MFI) levels ± SD of NS1 in cells gated on CD11chigh (left) or F4/80high (right) are shown. DCs and macrophages play an important role in primary defenses by generating and regulating adaptive immunity (1, 2, 3, 4). Viruses must evolve ways to modulate DC and macrophage function that enable them to evade detection and elimination by hosts. We examined the pattern of pro- and antiinflammatory cytokines produced by JEV-infected bmDCs and bmMφ to investigate JEV modulation on DC and macrophage function. As shown in Fig. 2⇓A, bmDCs produced high levels of IL-6, IL-10, IL-12, and TNF-α in response to JEV infection. The production of IL-6, IL-10, and TNF-α were detected as early as 6 h p.i. and peaked at 48 h p.i. However, IL-12 production showed later kinetics, being detectable only after 24 h p.i. The peak levels of IL-10 were observed at 24 h p.i., after which they declined to a level that was higher than that of mock-infected bmDCs. With regard to JEV-infected bmMφ, cytokine production showed a similar pattern to that observed in bmDCs. Importantly, however, IL-10 production was not detected at any of the time points (Fig. 2⇓A). Additionally, JEV-infected bmMφ produced greater amounts of TNF-α than did bmDCs, whereas higher amounts of IL-6 and IL-12 were produced in JEV-infected bmDCs than bmMφ. Moreover, the amount of cytokines produced after infection of both bmDCs and bmMφ with different doses of JEV varied depending on the infection doses (Fig. 2⇓B). To determine whether viral replication is required for the production of cytokines by bmDCs and bmMφ, we infected bmDCs and bmMφ with equivalent doses of live and UV-irradiated/heat-inactivated JEV. As shown in Fig. 2⇓C, JEV inactivated by UV irradiation and heat failed to induce the production of any cytokines, which indicates that viral replication was necessary for cytokine induction. Therefore, these results suggest that the interaction of JEV with DCs and macrophages may differ, leading to the production of divergent cytokines. The profiles of cytokines produced by DCs and macrophages infected with JEV. A, The pattern of cytokine production in JEV-infected DCs and macrophages. DCs (bmDCs) and macrophages (bmMφ) derived from bone marrow cells were infected with JEV Beijing-1 strain (5 × 105 TCID50/ml), after which the cytokine levels in culture supernatants harvested at the indicated times p.i. were determined by ELISA. B, Dependence of cytokine production on infection doses. The levels of cytokines in the culture supernatants of bmDCs and bmMφ infected with the indicated doses of JEV were determined at 24 h p.i. C, Viral replication is required for the production of cytokines by bmDCs and bmMφ. Bone marrow-derived cells were infected with live JEV (5 × 105 TCID50/ml) or equivalent amounts of viruses that were inactivated by UV irradiation and heat (heating at 95°C for 10 min), and the cytokine levels in culture supernatant were then quantified by ELISA at 24 h p.i. Data represent the means ± SD from wells evaluated in quadruplicate. n.d., Not detected. Costimulatory molecules expressed on APCs are also critical to the optimal development of adaptive immune responses. Costimulatory molecules are up-regulated after activation of APCs upon pathogen exposure, which enables APCs to provide adequate immune responses. Therefore, alteration of costimulatory molecules expressed on APCs may be a major target of viral immune evasion. To determine whether JEV induced alteration of costimulatory activation markers in both DCs and macrophages, we examined the expression levels of CD40, CD80, CD86, MHC class I, and MHC class II molecules in JEV-infected DCs and macrophages by flow cytometric analysis. As shown in Fig. 3⇓A, JEV infection resulted in differential modulation of costimulatory molecules in both bmDCs and bmMφ. Specifically, CD40 and MHC class II expression in bmDCs was profoundly down-regulated by JEV infection, while CD80 and CD86 showed enhanced expression (Fig. 3⇓A). The enhanced expression of MHC class I molecule was also observed in JEV-infected bmDCs, as seen in other flaviviral infection (45). In contrast, after JEV infection bmMφ showed clearly enhanced expression of all CD40, CD80, CD86, and MHC classes I and II molecules that were evaluated in this study (Fig. 3⇓A). Moreover, when we examined the number of splenic DC subsets and macrophages in mice infected with JEV, the significantly reduced number of splenic CD11chighCD8α+ DC subset was observed at 7 days p.i., the time when viral RNA load was found to peak. However, there was no change in the number of plasmacytoid DC (CD11chighB220+) and macrophages (F4/80highCD11b+) (supplemental Table I).5 Also, JEV infection induced similar in vivo modulation of costimulatory molecules in splenic CD11chigh DCs and F4/80high macrophages. With the exception of CD80, CD86, and MHC class I molecules, the expression of CD40 and MHC class II molecules was consistently reduced in splenic CD11chigh DCs, which followed the pattern observed with in vitro experiments (Fig. 3⇓B). In contrast, splenic F4/80high macrophages showed enhanced expression of all tested activation markers following JEV infection (Fig. 3⇓B). These results suggest that JEV induces differential alteration of the expression of costimulatory activation markers in DCs and macrophages. Phenotypic changes in DCs and macrophages infected with JEV. A, Phenotypic changes of bmDCs and bmMφ. DCs (bmDCs) and macrophages (bmMφ) derived from bone marrow cells were infected with JEV Beijing-1 strain (5 × 105 TCID50/ml) and used to stain activation phenotypic markers (CD40, CD80, CD86, MHC classes I and II) at 24 h p.i. The values in histograms denote the relative MFI levels of the indicated phenotypic markers. B, The in vivo activation of splenic DCs and macrophages in JEV-infected mice. Splenocytes of C57BL/6 mice infected i.p. with JEV (103 TCID50) were prepared by digestion with collagenase 7 days p.i. and used to stain surface activation markers. The histogram of the expression of the indicated molecule in cells gated on CD11chigh and F4/80high cells is representative of four mice, and the values in histograms are the average of relative MFI levels obtained from each mouse. APCs have a range of innate receptors, including TLRs and non-TLRs, that recognize pathogens (8). To examine the role that TLRs play in the induction of cytokines by DCs and macrophages following JEV infection, we used DCs and macrophages derived from mice that lacked the MyD88 molecule, which acts as an adaptor molecule in signal transduction from all TLRs except TLR3. As shown in Fig. 4⇓A, bmDCs prepared from MyD88-deficient mice showed reduced production of IL-6, IL-10, IL-12, and TNF-α following JEV infection, when compared with bmDCs from wild-type mice. Similarly, JEV-infected bmMφ showed reduced production of inflammatory cytokines in the absence of the MyD88 adaptor molecule. These findings suggest that cytokine production from JEV-infected DCs and macrophages is partially dependent on signal transduction by MyD88 adaptor molecule. In particular, IL-6, IL-10, and IL-12 production was markedly reduced in the absence of MyD88 adaptor molecule, whereas TNF-α production by MyD88-deficient bmDCs was not significantly reduced (Fig. 4⇓A). Furthermore, bmDCs and bmMφ derived from MyD88-deficient mice also showed altered phenotypes of costimulatory molecules following JEV infection (Fig. 4⇓B). However, MyD88-deficient bmDCs and bmMφ failed to show more apparent changes in any of the tested comstimulatory molecules in response to JEV infection when compared with wild-type DCs. Consistent with these results, the production of cytokines by splenic CD11chigh DCs and F4/80high macrophages was found to depend on MyD88 adaptor molecule when splenic DCs and macrophages purified from wild-type and MyD88-deficient mice were used for JEV infection (Fig. 4⇓C). These findings indicate that MyD88 adaptor molecule and possibly TLRs play a role in shaping innate and adaptive immune responses against JEV. Moreover, these results suggest that other MyD88-independent pathways contribute to functional modulation of DCs and macrophages following JEV infection, since the complete disappearance of cytokine production and the expression of costimulatory molecules in MyD88-deficient cells was not observed. To further characterize the signal transduction involved in the production of cytokines by JEV-infected DCs, we used several inhibitors of MAPK, including p38, ERK, JNK, and MEK-1. Of these inhibitors, treatment with p38 MAPK inhibitor (SB203580) resulted in a marked reduction of IL-6, IL-10, IL-12, and TNF-α production by wild-type bmDCs following JEV infection (Fig. 4⇓D), which suggests that the p38 MAPK pathway plays a pivotal role in cytokine production by JEV infection. Taken together, these results demonstrate that the MyD88-dependent signal pathway may be involved in cytokine production by JEV-infected DCs along with other MyD88-independent cellular signal pathways. Involvement of MyD88 adaptor molecule and p38 MAPK in the production of cytokine by DCs and macrophages infected with JEV. A, The production of cytokines from JEV-infected DCs and macrophages is partially dependent on the MyD88 adaptor molecule. bmDCs and bmMφ prepared from wild-type (C57BL/6) and MyD88-deficient (MyD88 KO) mice were infected with JEV Beijing-1 strain (5 × 105 TCID50/ml). The cytokine levels in culture supernatants of the infected bmDCs were quantified by ELISA at 24 h p.i. B, The phenotypic changes of MyD88-deficient DCs and macrophages following JEV infection. The expression levels of activation phenotypic markers (CD40, CD80, CD86, MHC classes I and II) were determined by flow cytometric staining using the appropriated Abs at 24 h p.i. The bars in graph show the average ± SD of the relative MFI obtained from the treated group (n = 4). C, The cytokine production of splenic DCs and macrophages purified from wild-type and MyD88-deficient mice following JEV infection. The levels of cytokines produced by splenic CD11chigh DCs and F4/80high macrophages of wild-type and MyD88-deficient mice were determined by ELISA 24 h following JEV infection. D, Dependence of cytokine production by JEV-infected DCs on p38 MAPK. DCs derived from bone marrow cells of C57BL/6 mice were infected with JEV in the presence or absence of p38 inhibitor (SB203580; 500, 50, and 5 μM). The cytokine levels in the culture supernatant of infected DCs were determined by ELISA at 24 h p.i. *, p < 0.05; **, p < 0.01; ***, p < 0.001 compared with the levels of wild-type DCs infected with JEV; n.d., not detected. DCs are key players in the generation of adaptive T cell responses through presentation of cognate Ags to T cells using MHC molecules. The quality and quantity of T cell responses is determined not only by the level of Ag presented but also by the costimulatory signals stimulated by the interaction of costimulatory molecules on APCs with their ligands and the cytokine milieu. In a view of the altered phenotype and cytokine production that occur in response to infection, JEV-infected DCs may have important effects on T cell priming and proliferation and the subsequent generation of effector functions. To explore the ability of JEV-infected DCs to prime Ag-specific CD4+ and CD8+ T cells, we used a TCR-transgenic model system of OT-II and OT-I mice from which we isolated a homogeneous population of naive Ag-specific CD4+ and CD8+ T cells. As shown in Fig. 5⇓, A and B, the primary proliferation and cytokine production of CD4+ and CD8+ T cells were assessed after JEV-infected bmDCs that had been pulsed with cognate peptide were cocultured with CD4+ and CD8+ T cells purified from OT-II and OT-I mice, respectively. CD4+ and CD8+ T cells primed with JEV-infected bmDCs showed significantly less proliferation than did those that were primed with mock-infected bmDCs. The differences were more apparent when the ratio of DCs to T cells was low, due to increased competition for DCs. Similarly, CD4+ and CD8+ T cells primed with JEV-infected bmDCs were found to produce reduced amounts of the cytokines IL-2, IL-4, and IFN-γ (Fig. 5⇓, A and B). To further confirm the defective ability of JEV-infected DCs to prime CD4+ and CD8+ T cells, the ability of splenic CD11chigh DCs from JEV-infected mice to support CD4+ and CD8+ T cell proliferation was compared with that of splenic CD11chigh DCs from uninfected mice (Fig. 5⇓C). Splenic CD11chigh DCs from JEV-infected mice were found to have a decreased ability to induce the proliferation of Ag-specific CD4+ and CD8+ T cells. Therefore, these results indicate that JEV induces defective T cell responses through modulation of the function of DCs. The ability of JEV-infected DCs to prime Ag-specific CD4+/CD8+ T cells. A and B, Priming of Ag-specific CD4+ (A) and CD8+ (B) T cells with JEV-infected bmDCs. DCs derived from bone marrow cells were infected with JEV Beijing-1 strain (5 × 105 TCID50/ml) and then used to prime CD4+/CD8+ T cells 24 h later. CD4+ and CD8+ T cells, which were purified from corresponding OT-II and OT-I mice, were incubated with JEV- and mock-infected bmDCs in the presence of OVA323–339 peptide (500 nM) for CD4+ T cells and OVA257–264 peptide (100 nM) for CD8+ T cells at different ratios. The levels of cytokine IFN-γ, IL-4, and IL-2 in culture supernatant were determined by ELISA at the indicated time. C, Splenic CD11chigh DCs obtained from JEV-infected mice have a reduced ability to stimulate CD4+ and CD8+ T cells. CD4+ and CD8+ T cells were purified from corresponding OT-II and OT-I mice and stimulated with splenic CD11chigh DCs purified from mice that were previously infected with JEV (103 TCID50). The proliferation of CD4+ and CD8+ T cells was assessed by a bioluminescence assay following 72 h of incubation. The means ± SD of RLUs from wells evaluated in quadruplicate are shown. *, p < 0.05; **, p < 0.01; ***, p < 0.001 compared with mock-infected group. As with costimulatory molecules on the surface of DCs and soluble mediators in the microenvironment, several factors determine the optimal priming of CD4+ and CD8+ T cells by DCs. Conversely, the presence of soluble factors such as IL-10 may exert negative influences on the priming of CD4+ and CD8+ T cells. Furthermore, since DCs may function as an IL-10 source in JEV infection through MyD88-dependent and -independent pathways, we employed the neutralization of IL-10 biological activity with an IL-10-neutralizing Ab to investigate the role that IL-10 plays in impaired priming of CD4+ and CD8+ T cells by JEV-infected DCs. 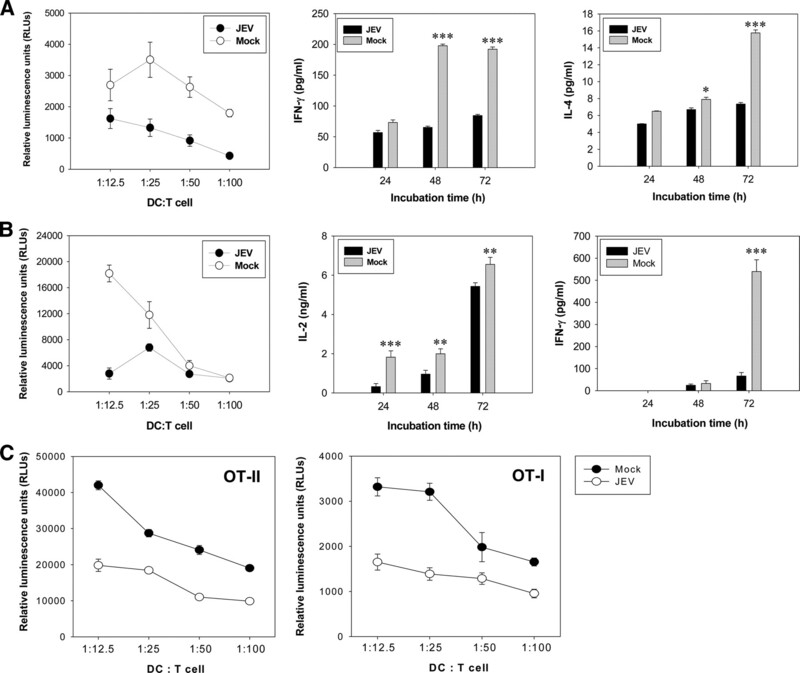 The incorporation of neutralizing IL-10 Ab in the coculture media of purified CD4+ T cells and JEV-infected bmDCs induced no significant changes in the suppression of the proliferation of CD4+ T cells (Fig. 6⇓A). However, suppression of the proliferation of CD8+ T cells by JEV-infected bmDCs was reversed by the incorporation of neutralizing IL-10 Ab (Fig. 6⇓B). Therefore, this suggests that IL-10 from JEV-infected DCs mediates reduced priming of CD8+ T cells, but not CD4+ T cells. IL-10 acts on APCs and causes down-regulation of their activation status. To test if the incorporated IL-10 Ab affected the altered phenotype of JEV-infected bmDCs, we examined the phenotypic modulation of JEV-infected bmDCs in the presence of neutralizing IL-10 Ab. As shown in Fig. 6⇓C, the neutralization of IL-10 activity led to partial recovery of the expression of CD40 and MHC class II molecules on infected bmDCs. Taken together, these results suggest that IL-10 produced by JEV-infected DCs can mediate impaired responses of CD8+ T cells. However, the reduced priming of CD4+ T cells by JEV-infected DCs may occur through unknown pathways. Neutralization of IL-10 rescues the suppressed proliferation of CD8+ T cells mediated by JEV-infected bmDCs, but not CD4 T cells. A and B, The proliferation of Ag-specific CD4+ (A) and CD8+ (B) T cells with JEV-infected bmDCs in the presence of IL-10 neutralizing Ab. DCs derived from bone marrow cells of wild-type C57BL/6 mice were infected with JEV Beijing-1 strain (5 × 105 TCID50/ml) and then pulsed with cognate antigenic peptide of CD4+ and CD8+ T cells obtained from OT-II (CD4) and OT-I (CD8) mice 24 h later. 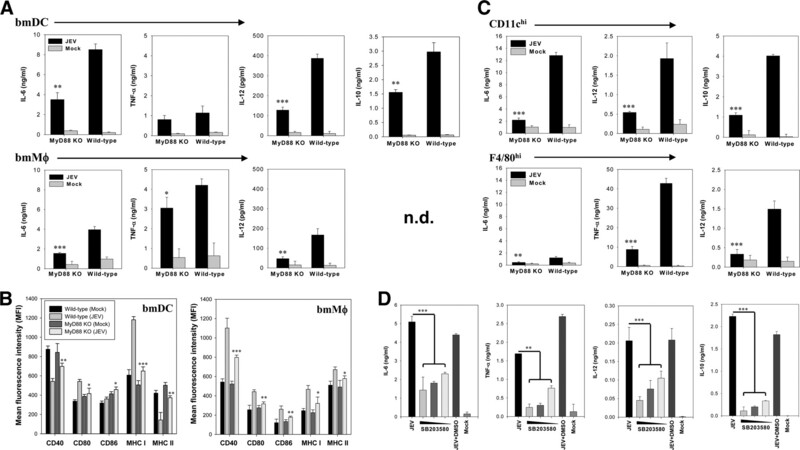 The proliferation of CD4+ and CD8+ T cells was assessed by using a bioluminescence assay following a 96-h incubation with treated bmDCs in the presence of IL-10 neutralizing Ab. The means ± SD of RLUs from wells evaluated in quadruplicate are shown. C, Phenotypic change in bmDCs following JEV infection in the presence of IL-10-neutralizing Ab. DCs were infected with JEV in the presence or absence of IL-10-neutralizing Ab and used for flow cytometric staining of the surface activation markers (CD40, CD80, CD86, MHC classes I and II) 24 h later. The bars in graph show the average ± SD of relative MFI obtained from each treated group (n = 4). **, p < 0.01; ***, p < 0.001 compared with JEV plus isotype-treated group. To test the involvement of MyD88 molecule in defective priming of CD4+ and CD8+ T cells by JEV-infected DCs, when we examined the capacity of MyD88-deficient DCs to prime CD4+ and CD8+ T cells after JEV infection, MyD88-deficient DCs showed higher proliferation of CD4+ and CD8+ T cells than did wild-type DCs (data not shown), which indicates that MyD88 adaptor molecule may mediate impairment of JEV-infected DCs to prime CD4+ and CD8+ T cells. Therefore, to determine the involvement of MyD88 adaptor molecule in in vivo defective CD4+ and CD8+ T cell responses in JEV-infected mice, we investigated the generation of CD4+ and CD8+ T cell responses using an HSV-1 challenge model. As shown in Fig. 7⇓, wild-type and MyD88-deficient mice were immunized with HSV-1 seven days after JEV infection because viral RNA load and reduced numbers of DC subsets were found to peak at this time. The responses of CD4+ and CD8+ T cells were then evaluated. Mice infected with JEV had significantly decreased HSV-specific proliferation of purified CD4+ T cells and 2-fold fewer IFN-γ-producing CD4+ T cells in response to HSV-1 antigenic stimulation than did the mock-infected group (Fig. 7⇓A). Such suppressed responses of CD4+ T cells by JEV infection were observed to be more obvious in wild-type mice than those in MyD88-deficient mice, which indicated that the MyD88 adaptor molecule plays a role in generation of Ag-specific responses following JEV infection. It is also interesting to note that MyD88-deficient mice showed reduced responses of CD4+ T cells when compared with wild-type mice. Similarly, mice that received JEV infection showed markedly suppressed CD8+ T cell responses when HSV-specific CD8+ T cells were observed by in vivo CTL killing activity (Fig. 7⇓B). JEV infection resulted in an average of 27% lysis of specific targets in spleen, whereas 97% lysis of the targets was observed in mock-infected mice. 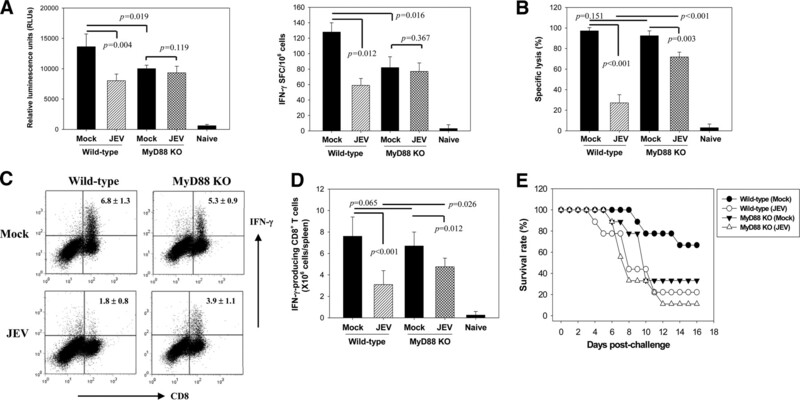 In the absence of MyD88 adaptor molecule, such differences of CD8+ T cell responses between JEV- and mock-infected mice were significantly reduced, and MyD88-deficient mice mounted comparable HSV-specific CD8+ T cell responses to wild-type mice (Fig. 7⇓B). Consistent with these results, JEV-infected mice were found to have a decreased number of IFN-γ-producing CD8+ T cells following stimulation with immunodominant epitope of HSV-1 (gB498–505, SSIEFARL), which resulted in partial recovery due to the lack of MyD88 molecule (Fig. 7⇓, C and D). These results demonstrate that MyD88 adaptor molecule may be involved in the subversion of CD4+ and CD8+ T cell responses by JEV infection. Reduced induction of CD4+ and CD8+ T cell responses in JEV-infected mice depends on MyD88 adaptor molecule. A, Reduced responses of CD4+ T cells in JEV-infected mice. After infecting C57BL/6 (Wild-type) and MyD88-deficient (MyD88 KO) mice with JEV (103 TCID50), mice were immunized intramuscularly with HSV-1 (106 PFU/mouse) 7 days after JEV infection. After 14 days, the responses of the purified CD4+ T cells to HSV-1 Ag stimulation were evaluated by proliferation using a viable cell ATP bioluminescence assay (left) and enumeration of the IFN-γ-producing cells using ELISPOT (right). B, Suppressed in vivo CTL killing activity of Ag-specific CD8+ T cells in JEV-infected mice. JEV- and mock-infected (C57BL/6 and MyD88-deficient) mice were immunized with HSV-1 seven days p.i., and the activity of in vivo CTL was assessed 14 days later. The bars in graph denote the mean ± SD of specific lysis (%) observed from four mice per group. C, IFN-γ-producing CD8+ T cells in response to the immunodominant gB498–505 (SSIEFARL) peptide of HSV-1. Fourteen days after immunization of JEV-infected mice with HSV-1, mice were reimmunized with HSV-1 to induce recall response. The number of IFN-γ-producing CD8+ T cells were then determined by intracellular cytokine staining 5 days later. The dot plot represents one of four mice per group, and the percentages seen in the upper right quadrant show the means ± SD. D, The total number of SSIEFARL-specific CD8+ T cells determined by intracellular cytokine staining. Data represent the mean ± SD of four mice per group. E, Susceptibility of JEV-infected mice against HSV-1 zosteriform infection. C57BL/6 and MyD88-deficient mice (n = 9) were infected with zosteriform of HSV-1 strain 17 seven days after being infected i.p. with JEV. The graphs show the proportion of surviving mice on different days p.i. To test if defective T cell responses in response to JEV infection result in greater susceptibility to secondary microbial infection, C57BL/6 mice that were previously infected with JEV were challenged with zosteriform infection of HSV-1 strain 17 on the day 7 p.i. Despite that JEV induced no morbidity and mortality, clinical signs of HSV zosteriform infection progressed at a much faster rate in JEV-infected mice than in mock-infected mice (Fig. 7⇑E). Furthermore, 66% of HSV-challenged mock-infected mice survived for 17 days p.i., while only 22% of JEV-infected mice survived for the same length of time (p = 0.041). MyD88-deficient mice that received JEV infection showed enhanced susceptibility to HSV-1 zosteriform infection, but this enhanced susceptibility was not significantly different from that of mock-infected MyD88-deficient mice. On the other hand, the susceptibility of MyD88-deficient mice to HSV-1 zosteriform infection was greater than in wild-type mice, as supported by a previous report (46). 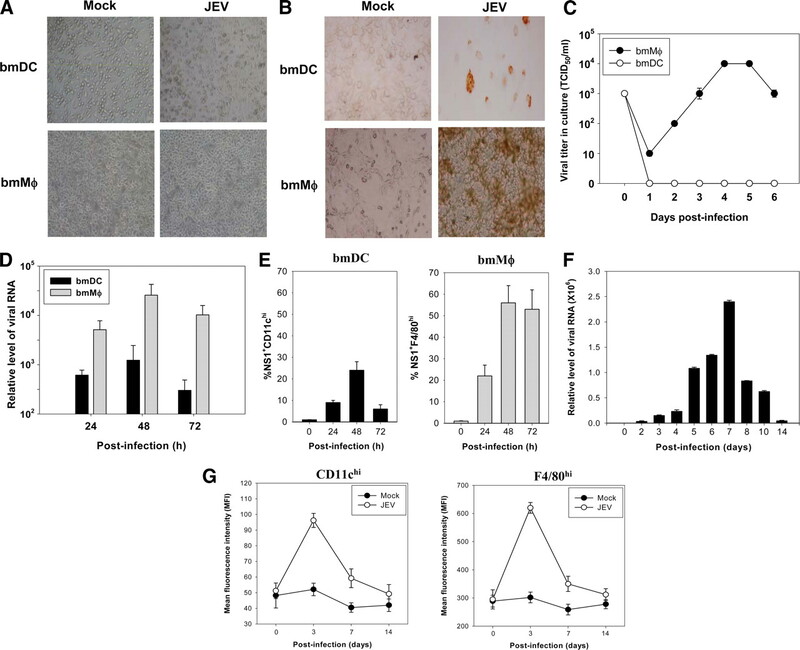 Taken together, these results suggest that JEV infection can cause impaired CD4+ and CD8+ T cell responses in MyD88-dependent and -independent manners, which result in the generation of defective antiviral immune responses. DCs and macrophages play important roles in conferring antiviral immunity during the initial stages of viral infection. Recognition of viral infection by DCs and macrophages through TLR and/or non-TLR sensors induces immediate production of inflammatory cytokines that subsequently provide early antiviral immunity (6, 7, 8). In addition to activation of innate effector cells, signals from TLRs and/or non-TLRs result in maturation of macrophages and DCs, thereby leading to T cell priming. Thus, signals of innate receptors are necessary to translate innate immunity into Ag-specific responses of the adaptive immune system (6, 7, 8, 9, 10, 11, 12). However, increased levels of inflammatory mediators can initiate irreversible immune responses and lead to cell death (29). Therefore, a direct viral cytopathic response and both direct and indirect immunological responses can contribute to CNS degeneration through JEV-infected cell exclusion by macrophages and CTLs, secretion of cytokines and chemokines, and activation of microglia (30, 31, 32, 33). Although DCs are critical to the priming of antiviral adaptive immune responses, few studies have been conducted to evaluate viral infection of DCs and their role in JEV infection. The results of the present study suggest that JEV-infected DCs undergo modulation that differs from macrophages with respect to cytokine production and phenotypic changes. Furthermore, signaling through the MyD88 adaptor molecule was found to have a certain role in causing subversion of primary CD4+ and CD8+ T cell responses. We also demonstrated that IL-10 produced by JEV-infected DCs was capable of mediating the reduced priming of CD8+ T cells but not CD4+ T cells. Therefore, our results demonstrate that JEV induces the functional impairment of DCs that leads to poor responses of CD4+ and CD8+ T cells through MyD88-dependent and -independent pathways. During viral infection, DCs undergo maturation that is manifested by up-regulation of Ag presentation, costimulatory molecules, and cytokine secretion (6, 7). Our study revealed that JEV infection of macrophages followed the classical pathway of up-regulation of tested costimulatory molecules and cytokine production (Figs. 2⇑ and 3⇑), but that JEV-infected DCs failed to up-regulate some costimulatory molecules. Of more interest, JEV-infected DCs produced the antiinflammatory cytokine IL-10, which was not detected in JEV-infected macrophages (Fig. 2⇑). IL-10 blocks proinflammatory cytokine production, costimulation, MHC class II expression, and chemokine production (47, 48). IL-10 is also released with, or after, the secretion of proinflammatory cytokines in an effort to maintain homeostasis (49). Indeed, IL-10 was released from JEV-infected DCs along with the proinflammatory cytokines IL-6, IL-12, and TNF-α. Because the cytokine milieu in the microenvironment in which T cell and DC contact occurs is an important determinant of T cell outcome, alteration of the DC-produced cytokine profile may be an effective strategy for the prevention of T cell activation during viral infection (50). Neutralizing Ab assays of IL-10 consistently demonstrated that IL-10 produced by JEV-infected DCs functioned as a mediator of the suppression of T cell activation, at least in CD8+ T cells (Fig. 6⇑). Furthermore, it was observed that MyD88 adaptor molecule mediated the production of IL-10 by JEV-infected DCs (Fig. 4⇑), which indicates that MyD88 molecule may play a role in subversion of CD8+ T cell responses through release of regulatory soluble factors such as IL-10. However, the incorporation of IL-10 Ab failed to recover suppressed CD4+ T cell responses, even when the expression of MHC class II and CD40 molecules was partially recovered. Therefore, the unknown pathway by which JEV-infected DCs showed impaired CD4+ T cell responses requires further study. Recent studies have revealed that excessive amounts of IL-6 and other proinflammatory cytokines have deleterious effects on T cell responses (51), suggesting that IL-10, which is known to inhibit DC maturation, may act synergistically with IL-6 and cause further down-regulation of the functions by which DCs prime T cells. To further define the signal pathway that leads to the production of pro- and antiinflammatory cytokines in JEV-infected DCs and macrophages, we determined the levels of cytokine production using MyD88-deficient DCs and macrophages. The incomplete inhibition of cytokine production in the MyD88-deficient DCs and macrophages may occur as a result of NF-κB and MAPK also being activated by the MyD88-independent pathway, and the intersection between the MyD88-dependent and -independent pathways is thought to be TRAF6 (20, 21). A few viruses are known to activate p38 MAPK and augment IL-10 production by host cells (52). Since the inhibition of p38 MAPK completely abrogated cytokine production by DCs in response to JEV infection (Fig. 4⇑D), activation of p38 MAPK through MyD88-dependent and possibly -independent signals may be critical to the production of cytokine by DCs following JEV infection. To support our finding regarding the role that the MyD88 molecule plays in modulation of DC function by JEV, we used a HSV-1 challenge model to demonstrate that JEV infection induced subversion of CD4+ and CD8+ T cell responses in a MyD88-dependent manner (Fig. 7⇑). The results suggested that impairment of DC function by JEV infection contributed to the reduction of CD4+ and CD8+ T cell responses, as shown in Fig. 5⇑. 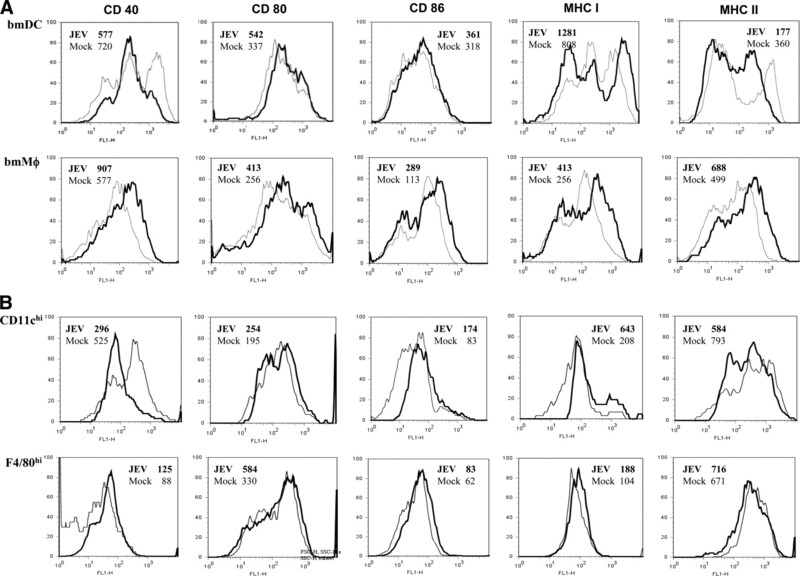 Additionally, MyD88-deficient DCs were found to have a comparable proliferation of CD4+ and CD8+ T cells after JEV infection, when demonstrated by the relative proliferation to maximum proliferation induced by mock-infected DCs (data not shown). Although MyD88-deficient DCs themselves showed poor proliferation of primary CD4+ and CD8+ T cells when compared with wild-type DCs, JEV infection may impair DC functions and induce subverted T cell responses, thereby leading to enhanced susceptibility to secondary microbial infections by viruses such as HSV zosteriform. JEV has a positive-sense, single-stranded RNA genome that could trigger signal through several TLR molecules such as TLR3 and TLR7 (8). When we examined the production of cytokines by TLR2- or TLR3-deficient DCs following JEV infection, the significantly reduced production of cytokines in response to JEV was shown, but complete inhibition was not induced (supplemental Fig. 1). Therefore, it is possible that JEV may synthesize an array of several agonists that can trigger TLR and/or non-TLR sensors. Besides alteration of cytokine profile, JEV infection elicited impairment of DC maturation, as evidenced by the phenotypic activation markers. Clear down-regulation of CD40 and MHC class II levels with marginal changes in CD80 and CD86 levels was observed in JEV-infected DCs. In contrast, macrophages elicited the classical maturation by JEV infection, as proved by the enhanced expression of tested costimualtory molecules. Moreover, the MyD88 adaptor molecule appeared to contribute to such alteration of phenotypic markers in JEV-infected DCs and macrophages (Fig. 4⇑B). Low expression of MHC class II and CD40 molecules will prevent DCs from their crucial interaction with CD4+ Th cells in a process called licensing, which is a step that is necessary to enable DCs to adequately prime CD8+ T cells (53). Viruses achieve down-regulation of MHC molecules by blocking trafficking to the cell membrane (54, 55), increasing destruction by ubiquitination (56), and preventing biosynthesis (57). Additionally, viruses such as murine cytomegalovirus down-regulate MHC class II molecules through IL-10 production (58). It is likely that IL-10 produced by DCs after JEV infection is involved in down-regulation of MHC class II levels since neutralization of IL-10 by mAb rescued the expression level of MHC class II. Interestingly, MHC class I was up-regulated by JEV infection in a manner similar to that observed in response to other flaviviruses (45), even though JEV-infected DCs showed poor proliferation of CD8+ T cells. Investigation using an IL-10-neutralizing Ab revealed that IL-10 may cause impaired responses in CD8+ T cells, even when there is enhanced expression of MHC class I molecule. Truly JEV induces a paralytic state in DCs that is coordinated with altered cytokine profile and phenotype marker, thereby predisposing the host to other viral infections. JEV infection of DCs has not been well characterized. We examined morphological changes in DCs and macrophages following JEV infection. There were no changes observed in macrophages, but morphological changes such as rounding and detachment from culture surfaces were observed in DCs, even though cell death through apoptosis did not follow. Also, it was likely that JEV did not replicate its RNA in DCs as efficiently as in macrophages, and infectious progeny viruses were not released from DCs. Since T cell activation occurs after the engagement of TCRs with DCs (1, 2), the functional impairment of DCs by JEV may also be secondary to morphological changes that result in disarranged cell architecture. Furthermore, since it was unlikely that all plated DCs and macrophages were infected by JEV (Fig. 1⇑E), some soluble factors released from JEV-infected cells may indirectly affect functions such as T cell priming in neighboring cells. In conclusion, JEV infection of DCs elicited early immune responses. These responses were characterized by the immediate production of pro- and antiinflammatory cytokines through MyD88-dependent and -independent pathways that resulted in p38 MAPK activation. IL-10 and reduced costimulation is likely incapable of providing adequate signals to initiate T cell priming. The findings presented herein suggest that imbalanced activation and modulation of both DCs and macrophages by JEV contribute to immunopathological degeneration of the CNS and prevent adequate signals from initiating antiviral adaptive immunity, thereby leading to boost virus survival and dissemination in the body. ↵1 This work was supported by Grant RTI05-03-02 from the Regional Technology Innovation Program of the Ministry of Commerce, Industry, and Energy (MOCIE), a research grant from the Bio-Safety Research Institute, Chonbuk National University, and by the Brain Korea 21 Project in 2008, Republic of Korea. ↵2 J.A.G. and Y.W.H. contributed equally to this work. ↵4 Abbreviations used in this paper: DC, dendritic cell; bmDC, bone marrow-derived DC; bmMφ, bone marrow-derived macrophage; gB, glycoprotein B; JEV, Japanese encephalitis virus; MFI, mean fluorescence intensity; NS1, nonstructural protein 1; p.i., postinfection; TCID50, 50% tissue culture-infective dose. Freigang, S., H. C. Probst, M. van den Broek. 2005. DC infection promotes antiviral CTL priming: the “Winkelried” strategy. Trends Immunol. 26: 13-18. Montaner, L. J., S. M. Crowe, S. Aquaro, C. Perno, M. Stevenson, R. G. Collman. 2006. Advances in macrophage and dendritic cell biology in HIV-1 infection stress key understudied areas in infection, pathogenesis, and analysis of viral reservoirs. J. Leukocyte Biol. 80: 961-964. Trifilo, M. J., B. Hahm, E. I. Zuniga, K. H. Edelmann, M. B. A. Oldstone. 2006. Dendritic cell inhibition: memoirs from immunosuppressive viruses. J. Infect. Dis. 194: (Suppl. 1):S3-S10. Zhang, Y., N. Chirmule, G. P. Gao, R. Qian, M. Croyle, B. Joshi, J. Tazelaar, J. M. Wilson. 2001. Acute cytokine response to systemic adenoviral vectors in mice is mediated by dendritic cells and macrophages. Mol. Ther. 3: 697-707. Kawai, T., S. Akira. 2006. Innate immune recognition of viral infection. Nat. Immunol. 7: 131-137. Takeuchi, O., S. Akira. 2008. MDA5/RIG-I and virus recognition. Curr. Opin. Immunol. 20: 17-22. Boehme, K. W., T. Compton. 2004. Innate sensing of viruses by Toll-like receptors. J. Virol. 78: 7867-7873. Balachandran, S., P. C. Roberts, L. E. Brown, H. Truong, A. K. Pattnaik, D. R. Archer, G. N. Barber. 2000. Essential role for the dsRNA-dependent protein kinase PKR in innate immunity to viral infection. Immunity 13: 129-141. Berghäll, H., J. Sirén, D. Sarkar, I. Julkunen, P. B. Fisher, R. Vainionpää, S. Matikainen. 2006. The interferon-inducible RNA helicase, mda-5, is involved in measles virus-induced expression of antiviral cytokines. Microbes Infect. 8: 2138-2144. López, C. B., J. S. Yount, T. M. Moran. 2006. Toll-like receptor-independent triggering of dendritic cell maturation by viruses. J. Virol. 80: 3128-3134. Liew, F. Y., D. Xu, E. K. Brint, L. A. J. O'Neill. 2005. Negative regulation of Toll-like receptor-mediated immune responses. Nat. Rev. Immunol. 5: 446-458. O'Neill, L. A. J.. 2006. How Toll-like receptors signal: what we know and what we don’t know. Curr. Opin. Immunol. 18: 3-9. Sasai, M., H. Oshiumi, M. Matsumoto, N. Inoue, F. Fujita, M. Nakanishi, T. Seya. 2005. Cutting edge: NF-κB-activating kinase-associated protein 1 participates in TLR3/Toll-IL-1 homology domain-containing adapter molecule-1-mediated IFN regulatory factor 3 activation. J. Immunol. 174: 27-30. Oshiumi, H., M. Matsumoto, K. Funami, T. Akazawa, T. Seya. 2003. TICAM-1, an adaptor molecule that participates in Toll-like receptor 3-mediated interferon-β induction. Nat. Immunol. 4: 161-167. Barton, G. M., R. Medzhitov. 2004. Toll signaling: RIPping off the TNF pathway. Nat. Immunol. 5: 472-474. Honda, K., H. Yanai, T. Mizutani, H. Negishi, N. Shimada, N. Suzuki, Y. Ohba, A. Takaoka, W. Yeh, T. Taniguchi. 2004. Role of a transductional-transcriptional processor complex involving MyD88 and IRF-7 in Toll-like receptor signaling. Proc. Natl. Acad. Sci. USA 101: 15416-15421. Kawai, T., S. Sato, K. J. Ishii, C. Coban, H. Hemmi, M. Yamamoto, K. Terai, M. Matsuda, J. Inoue, S. Uematsu, et al 2004. Interferon-α induction through Toll-like receptors involves a direct interaction of IRF7 with MyD88 and TRAF6. Nat. Imunol. 5: 1061-1068. Sato, S., M. Sugiyama, M. Yamamoto, Y. Watanabe, T. Kawai, K. Takeda, S. Akira. 2003. Toll/IL-1 receptor domain-containing adaptor inducing IFN-β (TRIF) associates with TNF receptor-associated factor 6 and TANK-binding kinase 1, and activates two distinct transcription factors, NF-κB and IFN-regulatory factor-3, in the Toll-like receptor signaling. J. Immunol. 171: 4304-4310. Jiang, Z., T. W. Mak, G. Sen, X. Li. 2004. Toll-like receptor 3-mediated activation of NF-κB and IRF3 diverges at Toll-IL-1 receptor domain-containing adapter inducing IFN-β. Proc. Natl. Acad. Sci. USA. 101: 3533-3538. Solomon, T.. 2004. Flavivirus encephalitis. New Eng. J. Med. 351: 370-378. Lindenbach, B. D., H. Thiel, C. M. Rice. 2006. Flaviviridae: the viruses and their replication. D. M. Knipe, and P. M. Howley, and D. E. Griffin, and R. A. Lamb, and M. A. Martin, eds. Fields Virology 5th ed.1101-1157. Lippincott Williams & Wilkins, Philadelphia. Mackenzie, J. S., D. J. Gubler, L. R. Petersen. 2004. Emerging flaviviruses: the spread and resurgence of Japanese encephalitis, West Nile and dengue viruses. Nat. Med. 10: S98-S109. Mackenzie, J. S.. 2005. Emerging zoonotic encephalitis viruses: lessons from Southeast Asia and Oceania. J. Neurovirol. 11: 434-440. Solomon, T.. 2006. Control of Japanese encephalitis: within our grasp?. New Eng. J. Med. 355: 869-871. Huy, B. V., H. C. Tu, T. V. Luan, R. Lindqvist. 1994. Early mental and neurological sequelae after Japanese B encephalitis. Southeast Asian J. Trop. Med. Public Health 25: 549-553. Kabilan, L., R. Rajendran, N. Arunachalam, S. Ramesh, S. Srinivasan, P. P. Samuel, A. P. Dash. 2004. Japanese encephalitis in India: an overview. Ind. J. Pediatr. 71: 609-615. Quagliarello, V. J., B. Wispelwey, W. J. Long, W. M. Scheld. 1991. Recombinant human interleukin-1 induces meningitis and blood-brain barrier injury in the rat: characterization and comparison with tumor necrosis factor. J. Clin. Invest. 87: 1360-1366. Khanna, N., M. Agnihotri, A. Mathur, U. C. Chaturvedi. 1991. Neutrophil chemotactic factor produced by Japanese encephalitis virus stimulated macrophages. Clin. Exp. Immunol. 86: 299-303. Ravi, V., S. Parida, A. Desai, A. Chandramuki, M. Gourie-Devi, G. E. Grau. 1997. Correlation of tumor necrosis factor levels in the serum and cerebrospinal fluid with clinical outcome in Japanese encephalitis patients. J. Med. Virol. 51: 132-136. Singh, A., R. Kulshreshtha, A. Mathur. 2000. Secretion of the chemokine interleukin-8 during Japanese encephalitis virus infection. J. Med. Microbiol. 49: 607-612. Ghoshal, A., S. Das, S. Ghosh, M. K. Mishra, V. Sharma, P. Koli, E. Sen, A. Basu. 2007. Proinflammatory mediators released by activated microglia induces neuronal death in Japanese encephalitis. Glia 55: 483-496. Kurane, I.. 2002. Immune responses to Japanese encephalitis virus. Curr. Top. Microbiol. Immunol. 267: 91-103. Jeong, H., J. Shin, Y. Park, J. Choi, Y. Kim, B. Kim, S. Ryu, S. Baek, S. Lee, S. Park. 2003. Development of real-time RT-PCR for evaluation of JEV clearance during purification of HPV type 16 L1 virus-like particles. Biologicals 31: 223-229. Lutz, M. B., N. Kukutsch, A. L. J. Ogilvie, S. Rossner, F. Koch, N. Romani, G. Schuler. 1999. An advanced culture method for generating large quantities of highly pure dendritic cells from mouse bone marrow. J. Immunol. Methods 223: 77-92. Coligan, J. E., B. E. Bierer, D. H. Margulies, E. M. Shevach, W. Strober. 2005. Short Protocols in Immunology 1st Ed. Wiley, New York. Kim, H., S. J. Lee, J. Y. Park, Y. W. Park, H. S. Kim, H. Kang, B. Hur, Y. Ryu, S. I. Han, J. S. Kim. 2004. Study on persistent infection of Japanese encephalitis virus Beijing-1 strain in serum-free Sf9 cell cultures. J. Microbiol. 42: 25-31. Eo, S. K., S. Lee, S. Chun, B. T. Rouse. 2001. Modulation of immunity against herpes simplex virus infection via mucosal genetic transfer of plasmid DNA encoding chemokines. J. Virol. 75: 569-578. Weyermann, J., D. Lochmann, A. Zimmer. 2005. A practical note on the use of cytotoxicity assays. Int. J. Pharm. 288: 369-376. Suvas, S., U. Kumaraguru, C. D. Pack, S. Lee, B. T. Rouse. 2003. CD4+CD25+ T cells regulate virus-specific primary and memory CD8+ T cell responses. J. Exp. Med. 198: 889-901. Gierynska, M., U. Kumaraguru, S. Eo, S. Lee, A. Krieg, B. T. Rouse. 2002. Induction of CD8 T-cell-specific systemic and mucosal immunity against herpes simplex virus with CpG-peptide complexes. J. Virol. 76: 6568-6576. Murali-Krishna, K., V. Ravi, R. Manjunath. 1995. Japanese encephalitis virus infection of mouse cell lines: ability to prime mice for generation of virus specific cytotoxic T lymphocytes and differences in CTL recognisable viral determinants. Arch. Virol. 140: 127-143. Müllbacher, A., M. Lobigs. 1995. Up-regulation of MHC class I by flavivirus-induced peptide translocation into the endoplasmic reticulum. Immunity 3: 207-214. Mansur, D. S., E. G. Kroon, M. L. Nogueira, R. M. E. Arantes, S. C. O. Rodrigues, S. Akira, R. T. Gazzinelli, M. A. Campos. 2005. Lethal encephalitis in myeloid differentiation factor 88-deficient mice infected with herpes simplex virus 1. Am. J. Pathol. 166: 1419-1426. Moore, K. W., A. O'Garra, R. de Waal Malefyt, P. Vieira, T. R. Mosmann. 1993. Interleukin-10. Annu. Rev. Immunol. 11: 165-190. Durez, P., D. Abramowicz, C. Gérard, M. van Mechelen, Z. Amraoui, C. Dubois, O. Leo, T. Velu, M. Goldman. 1993. In vivo induction of interleukin 10 by anti-CD3 monoclonal antibody or bacterial lipopolysaccharide: differential modulation by cyclosporin A. J. Exp. Med. 177: 551-555. Zhou, D., A. Munster, R. Winchurch. 1991. Pathologic concentrations of interleukin 6 inhibit T cell responses via induction of activation of TGF-β. FASEB J. 5: 2582-2585. Maloney, G., M. Schroder, A. G. Bowie. 2005. Vaccinia virus protein A52R activates p38 mitogen activated protein kinase and potentiates lipopolysaccharide-induced interleukin-10. J. Biol. Chem. 280: 30838-30844. Ostrowski, M. A., S. J. Justement, L. Ehler, S. B. Mizell, S. Lui, J. Mican, B. D. Walker, E. K. Thomas, R. Seder, A. S. Fauci. 2000. The role of CD4+ T cell help and CD40 ligand in the in vitro expansion of HIV-1-specific memory cytotoxic CD8+ T cell responses. J. Immunol. 165: 6133-6141. Neumann, J., A. M. Eis-Hubinger, N. Koch. 2003. Herpes simplex virus type 1 targets the MHC class II processing pathway for immune evasion. J. Immunol. 171: 3075-3083. Sievers, E., J. Neumann, M. Raftery, G. Schonrich, A. M. Eis-Hubinger, N. Koch. 2002. Glycoprotein B from strain 17 of herpes simplex virus type I contains an invariant chain homologous sequence that binds to MHC class Ii molecules. Immunology 107: 129-135. Cadwell, K., L. Coscoy. 2005. Ubiquitination on nonlysine residues by a viral E3 ubiquitin ligase. Science 309: 127-130. Kamp, W., M. B. Berk, C. J. Visser, H. S. Nottet. 2000. Mechanisms of HIV-1 to escape from the host immune surveillance. Eur. J. Clin. Invest. 30: 740-746. Redpath, S., A. Angulo, N. R. J. Gascoigne, P. Ghazal. 1999. Murine Cytomegalovirus infection down-regulates MHC class II expression on macrophages by induction of IL-10. J. Immunol. 162: 6701-6707.